We are consuming video content on a scale like never before. With faster internet speeds, bigger mobile devices and smarter televisions we are viewing video online every day of our lives. YouTube is the second most visited site globally and also the second most popular search engine. We watch 5 billion YouTube videos every single day. The younger generation is especially hooked with 6 out of 10 people now preferring online video platforms over traditional linear TV. If we want to know how to fix a puncture, cook a Risotto or hit a tennis serve, we no longer have to trawl through pages of online text. Online explainer videos will show us what we need to know instantly and far more effectively. This means that any business, no matter how small can reap huge benefits by creating their own video marketing content. Larger companies have known this for some years but with the new high quality cameras and smartphones, video content is getting easier and quicker to produce. Allowing all businesses to market their products via platforms such as YouTube, Facebook and Instagram. 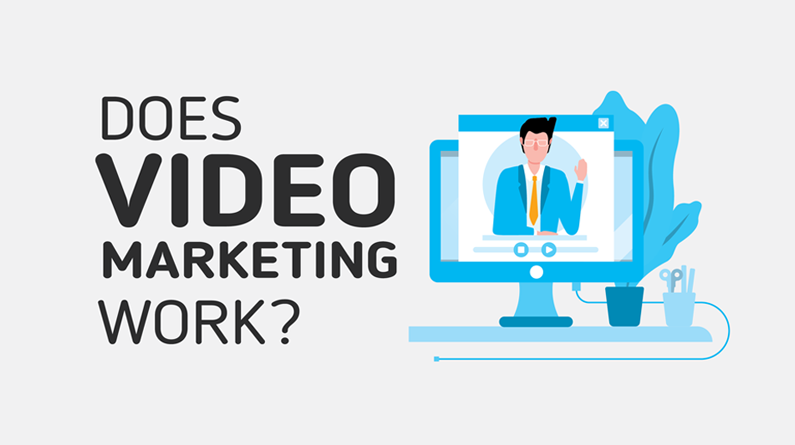 Video marketing is not a trend. It’s here to stay and the need for more video content will grow and grow. A landing page that includes video as the main source of information has been shown to increase conversion rates by 80%. Getting potential visitors to your site can be challenging and if you do manage to attract that elusive click by using Adwords, Social Media Marketing or SEO, an 80% improvement is clearly a massive advantage. Also if a visitor is viewing a video, they’re spending longer on your site. Google will recognise this and rank the page higher because of that retention. Google now own YouTube so if you have embedded a video from there, your SEO is also improved greatly. Studies have shown that the viewer values the actual content of your videos much more than the production value. If your film is shot in 8K with a £30,000 camera and perfect lighting but it fails to show the product in any detail, then you have failed in your message. It would be much more effective if you use an iPhone on a tripod but then truly demonstrate what your product is all about. Yes a higher production value makes things look better but above all else, it’s the product information that needs to be conveyed to the viewer first. A video that shows exactly what your product is or what your company offers. Visitors to your website will spend a lot longer watching a video than they would if they ‘skimmed’ pages of text. You can drive the narrative rather than risk potential customers miss important information about your product. Do you do things differently in your business? Maybe your USP (Unique Selling Point) is the ethical way that you manufacture your products or empower your workforce? A culture video can help convey the message to your customers and even build a relationship before an order is placed. These Virtual Reality immersive videos really are at the cutting edge of video production technology. Using a mobile device or even a VR Headset your customer can experience your product like never before. 360° video can be filmed from ground based cameras or even captured using our drones for the realistic ‘bird’s eye’ experience. The master of branding videos is definitely Red Bull. They produce incredible films that are shared thousands of times and have built one of the stongest brands in the world. An interview led film can be a hugely powerful marketing tool for your business. It allows your customers to praise your work in real world situations. This is a film that we made for DeLaval. They supply farming machinery to the dairy industry around the world. We are all human and we get bored very quickly. You must engage the customer in the first few seconds of the video or they will be clicking elsewhere. When we produce a video for our customers we always try and give them three different length edits. One short ‘teaser’ maybe 15-20 seconds. This will entice the customer to view more content. One 1 minute (or just under) for Instagram and one 2-3 minute video that will be viewed once customer is interested in your product. All of the videos are packed with the most important information in the first 8 seconds. A lot of content is consumed in places when the viewer’s phone is in ‘silent’ mode. Adding subtitles to your films means your customers can still view them on train, in a café or even at work. Half a million people in Wales speak Welsh and this figure is getting higher every year. Maybe you are selling your product abroad. If you have a multi language option on you video this is clearly in the interests of your customers. Where will your content be consumed? Decide before you start production on what platform the film will be shown. If Instagram followers are your target for instance, maybe a square or even vertical video would be more suitable. Especially if it’s for an Instagram Story. Videos can be expensive but they don’t have to be. It is important to decide what your total budget for the project will be before moving on to the next question. We know that it is massively important to list our customer’s requirements before we begin production. Seemingly small additions to the film can increase the production cost and erode your budget. Voiceovers, actors, subtitles or even helicopter shots can add cost to the filming that you hadn’t anticipated. We make sure we plan each aspect of the creative requirements and match them to the aforementioned budget. Decide how you are going to measure the success of your video marketing campaign. Set Key Performance Indicators that correspond to your goals. Is your branding video just for awareness then maybe video views are your goal? Or maybe it’s conversions that you need to track through your landing page. Here at Aerial Photography Wales we enjoy creating video marketing content for a diverse cross-section of UK companies. If you would like us to help you plan a video marketing strategy, contact us and we will be happy to discuss your requirements. If it’s a one-off explainer video or if you are looking to employ a creative agency to produce regular films for an ongoing campaign, Aerial Photography Wales can help. Click here to see some of the many films that we have produced recently and if you think that a similar approach to marketing would suit your company, feel free to get in touch with your requirements. Aerial Photography Wales are a team of photographers, film makers and editors based in South Wales. We work with all sizes of business to provide media content for their video marketing campaigns. We work with 30 of the top 300 companies in Wales (Admiral, Redrow, Dawnus, Kier, JEHU, Alun Griffiths and several local authorities). Our work has been shown on BBC, ITV, Channel 4 an Channel 5. We also work with many SMEs and the self employed. Including hairdressers, plumbers, tree surgeons, artists, locksmiths and builders. If you would like to speak to us about creating video content for your business, feel free to get in touch and we’ll be happy to help. See below an Infographic showing the current trends in video content marketing. Please feel free to share this image or even better, link to it. We would be eternally grateful!